© Wayne Darrell Crank Jr. 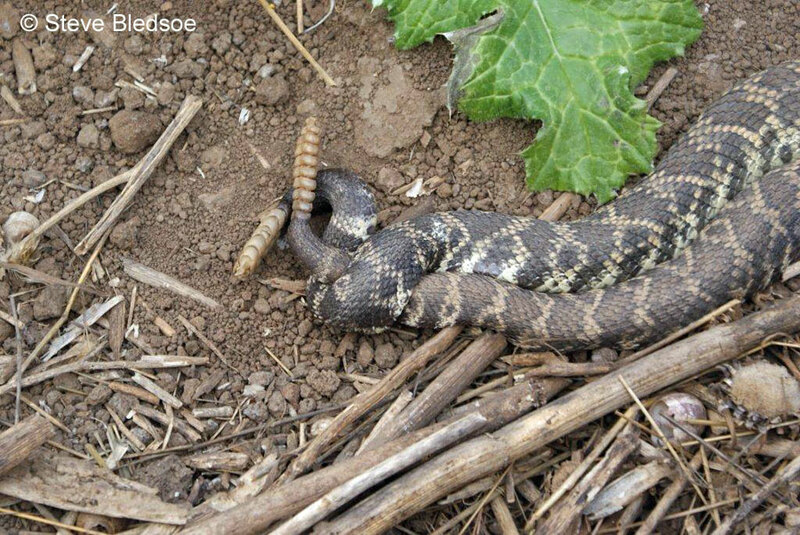 This adult Northern Pacific Rattlesnake from San Mateo County is missing its rattles. It appears that the end of its tail has been somehow cut off. This is extremely rare, but it proves the importance of recognizing the pattern, body shape, and head shape of the rattlesnakes in your area, because you can't always identify a rattlesnake just by the rattle at the end of the tail. 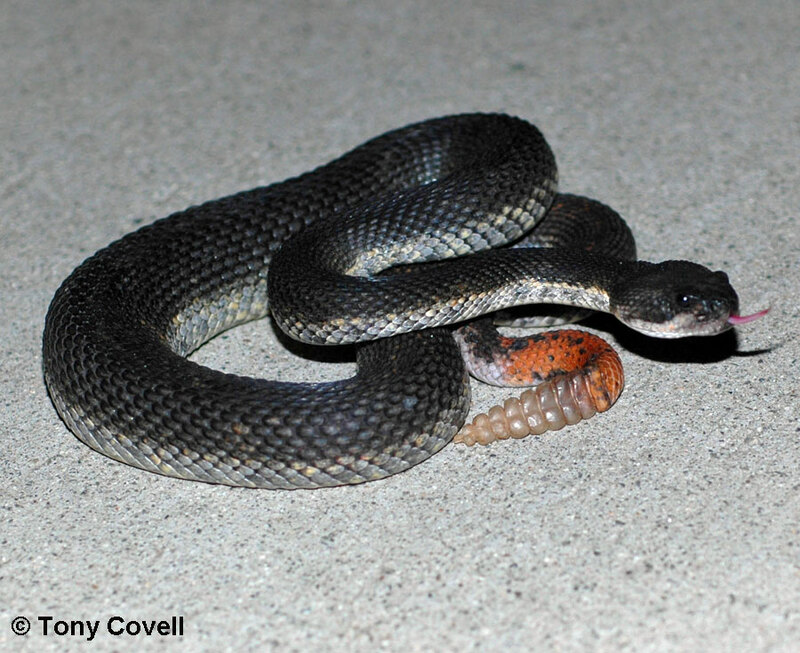 Melanistic patternless adult, Riverside County. © Patrick Briggs Melanistic adult, San Gabriel Mountains, Los Angeles County © Lori Paul. This snake had a completely dark belly. Adult, San Bernardino Mountains, San Bernardino County © Stuart Williams. This snake is ready to shed its skin, called being "in the blue," and it actually shows some blue coloring on the head and lower sides. 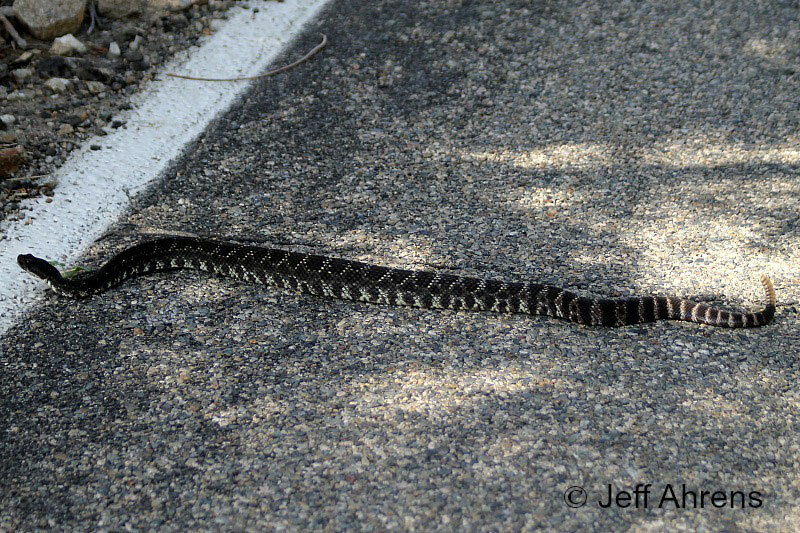 Intergrade with C. o. oreganus, Santa Barbara County © Benjamin German Southern Pacific Rattlesnakes that are almost entirely dark in color such as these occur around Southern California but they seem to be prevalent around Idyllwyld on Mount San Jacinto. Watch a YouTube Video of these snakes. Adult male and adult female mating in March in San Diego County. © Steve Bledsoe Two adults, probably a mating pair, exactly as found underneath a board in March in San Diego County grassland. Riverside County Snake in habitat, near La Jolla, San Diego County, about 1/3 mile from the beach. A Southern Pacific Rattlesnake poses and rattles and crawls away at night in Los Angeles County. 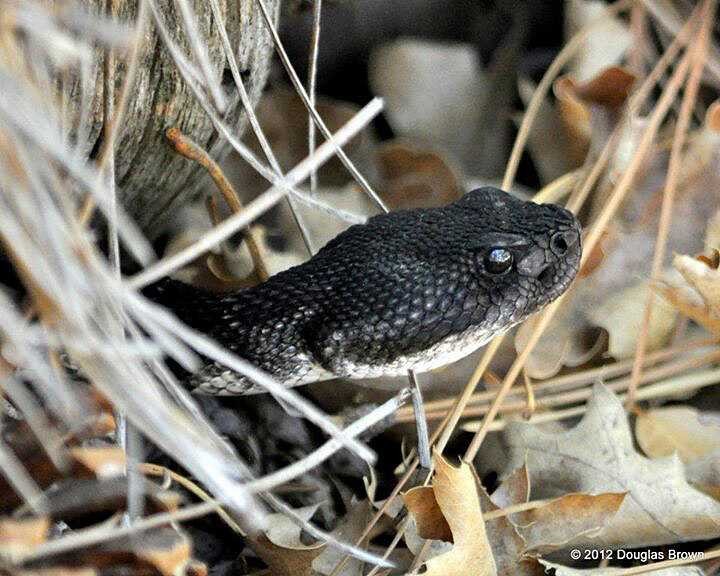 Listen to the rattling of a captive adult (shown above) courtesy of the Arizona-Sonora Desert Museum. © Jeff Rice / Western Soundscape Archive Not to be used without permission. Robert Hamilton's YouTube Video of two males wrestling for dominance. 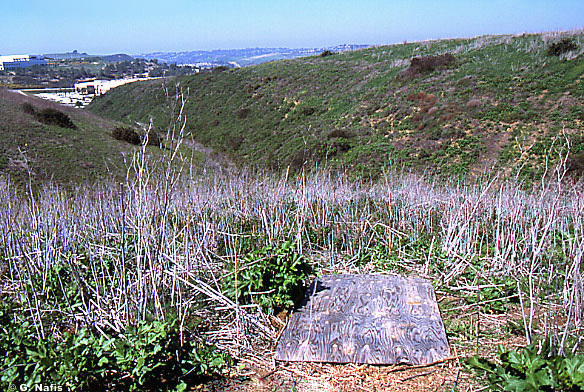 San Diego County park warning sign. 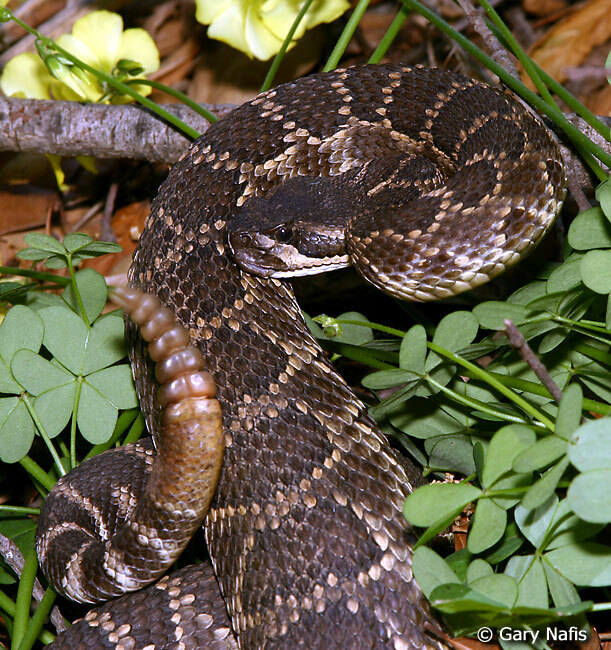 Rattlesnakes are important members of the natural community. They will not attack, but if disturbed or cornered, they will defend themselves. Reasonable watchfulness should be sufficient to avoid snakebite. Give them distance and respect. "Rattlesnakes are also among the most reasonable forms of dangerous wildlife: their first line of defense is to remain motionless; if you surprise them or cut off their retreat, they offer an audio warning; if you get too close, they head for cover. Venom is intended for prey so they're reluctant to bite, and 25 to 50 percent of all bites are dry - no venom is injected." Leslie Anthony. Snakebit: Confessions of a Herpetologist. Greystone Books, 2008. 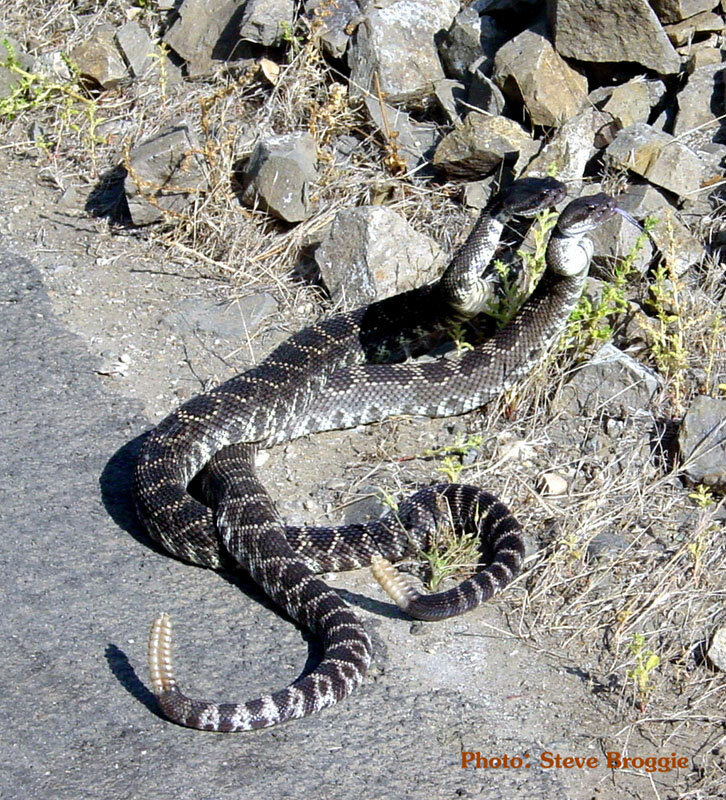 Rattlesnakes are the only kind of native California snakes that we typically refer to as poisonous, but actually, they are not poisonous they are venomous. A poisonous snake is one that is harmful to eat. A venomous snake injects dangerous venom into its victim. 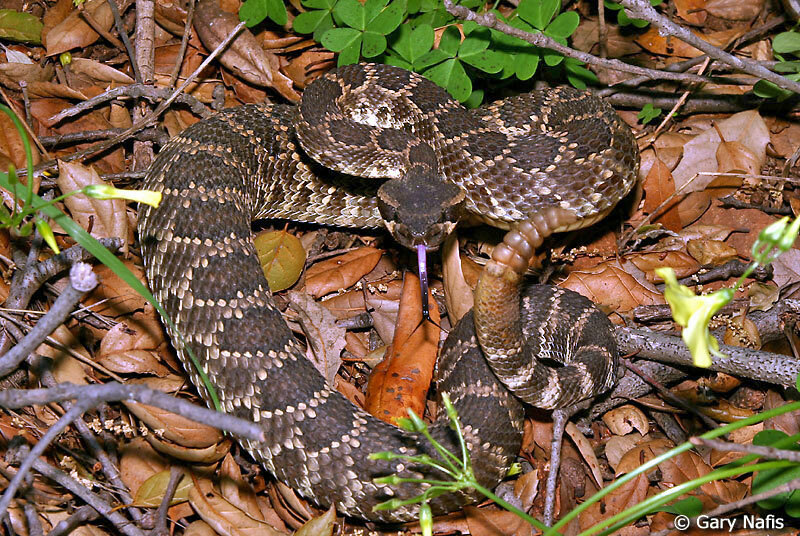 Rattlesnake bites can be extremely dangerous, but rattlesnakes should not be characterized as agressive and vicious, striking and biting without provocation, as they are often shown in movies and TV shows. If rattlesnakes are given some space and some time to escape to a safe place, they will usually just crawl away as fast as possible and avoid confrontation. Rattlesnakes will not strike without a reason: they will strike at a potential meal and they will defend themselves from anything they perceive as dangerous. They avoid striking and biting because it uses up their valuable supply of venom which they need to kill and digest their food. Rattlesnakes are often portrayed with the body partly coiled, the tail rattling loudly, and the head raised up and ready to strike, but they do not need to coil this way to strike. This display is a warning not to come any closer. It's a defensive behavior that some rattlesnakes use when they sense that crawling away would put them in danger of attack. Rattlesnaks do not always rattle. Often they will rattle loudly to warn potential enemies of their presence but they will often remain silent when they sense a threat, using their cryptic color and pattern to blend into their surroundings to hide from the threat. In this situation making noise risks advertising their presence. They also use their natural camouflage to hunt by sitting still and not rattling, trying to remain invisible as they wait for a warm-blooded prey animal to pass close enough for the snake to strike it. 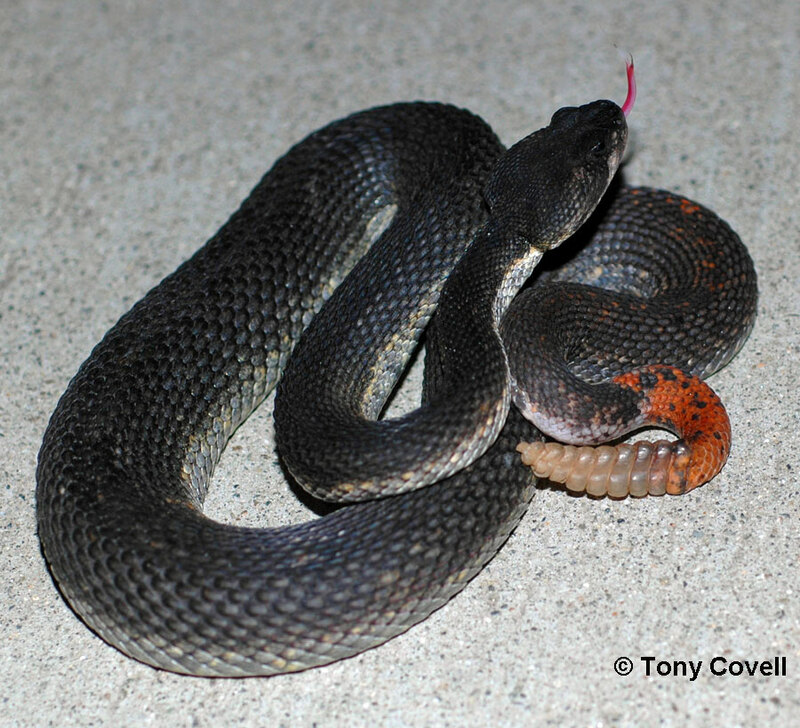 A bite from this snake can be very dangerous without immediate medical treatment. Treatment can require hospitalization and great expense. Adults 30 - 44 inches long, sometimes up to 54 inches. Newborns about 10 inches long. 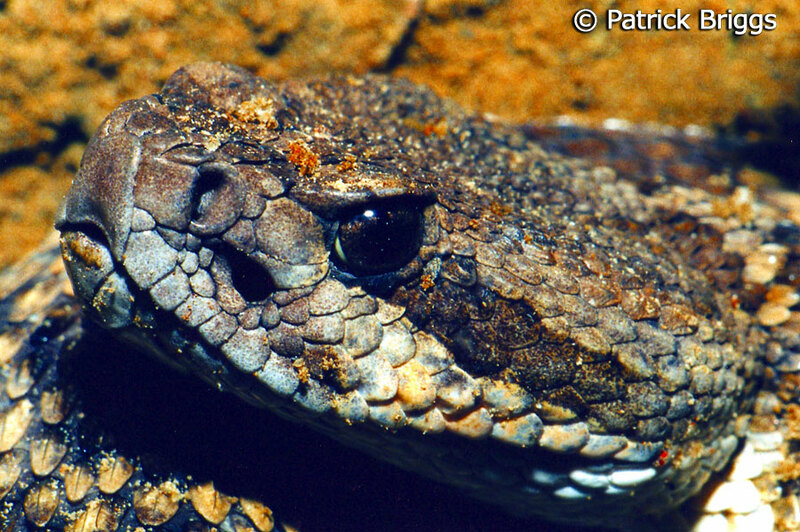 A heavy-bodied pit viper, with a thin neck, a large triangular head, and a rattle on the end of the tail consisting of loose interlocking hollow segments. A new rattle segment is added each time the skin is shed, which can be more than one time per year. Has two pits, one on each side of the front of the head above the mouth that are used to sense heat when hunting warm-blooded prey. Ground color is brown to olive-brown. Dark brown blotches, completely outlined by light pigment, mark the back. 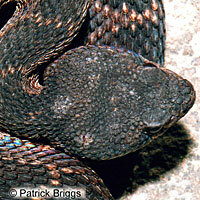 These blotches turn to bars toward the tail, which is surrounded with dark rings. The last tail ring is not well-defined and is more than twice the width of the other rings. The underside is pale, sometimes weakly mottled. Young are born with a bright yellow tail with no rattle - just a single button which does not make a sound. They grow rattles and lose the yellow color as they age. The pattern is brighter on juveniles than on adults. Sympatric with other species of rattlesnakes - Crotalus ruber, Crotalus mitchellii pyrrhus, and Crotalus scutulatus on the lower northern slopes of the San Gabriel Mountains. 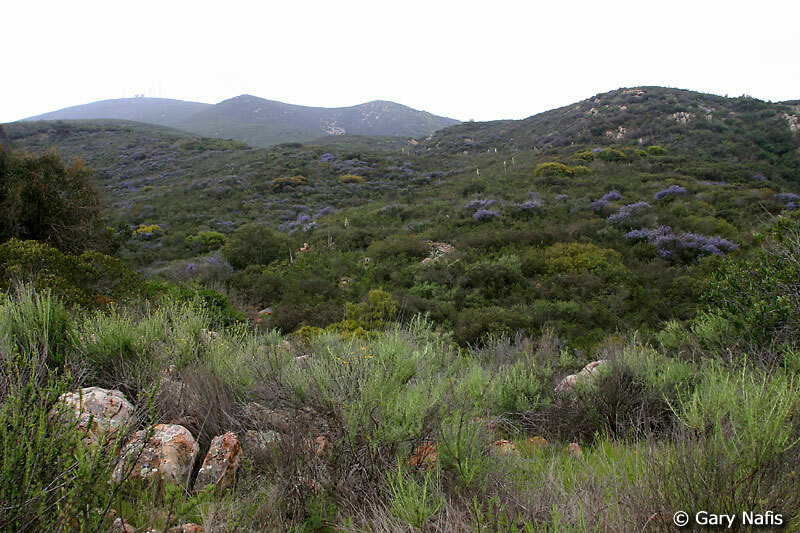 Two other subspecies of this species also occur in California. 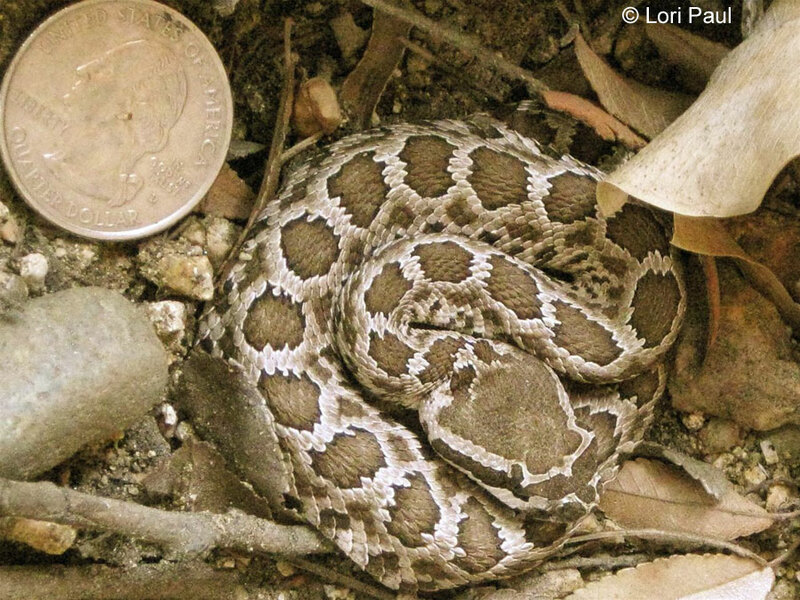 Notes on identifying subspecies of Western Rattlesnakes, Crotalus oreganus, found in California. Primarily nocturnal and crepuscular during periods of excessive daytime heat, but also active during daylight when the temperature is more moderate. Not active during cooler periods in Winter. 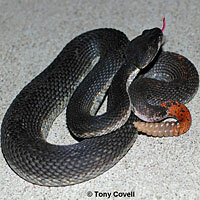 Radiotelemetry studies have shown that the home range of male snakes is larger than that of females. 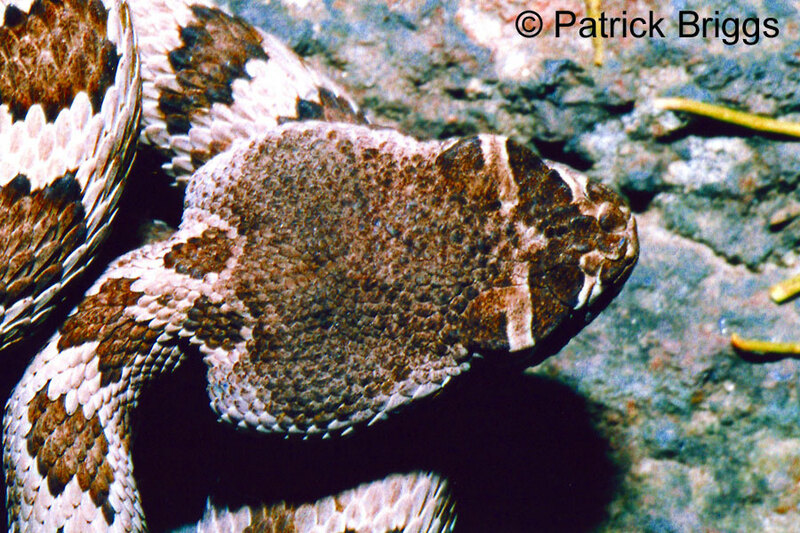 Rattlesnakes have long, hollow, movable fangs connected to venom glands. The fangs are replaced if broken. A snakes uses its fangs to inject a toxic venom which quickly immobilize its prey. 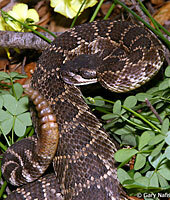 A rattlesnake can control the amount of venom injected. Bites that inject venom into humans are potentially dangerous without immediate medical treatment. Sometimes a rattlesnake bites but does not inject venom. These are called "dry bites." A dry bite may still require medical attention. Even a dead snake can bite and inject venom if the jaws open reflexively when they are touched. Prey is found while the snake is actively moving, or by ambush, where the snake waits near lizard or rodent trails, striking at and releasing passing prey. The snake then follows the trail of the envenomated animal and swallows it whole. Pits on the sides of the head sense heat. These heat sensors help the snake to locate prey by their warmth. Rattlesnakes are ovoviparous. The mother keeps her fertilized eggs inside her body and gives birth to living young. Breeding typically occurs in the spring. Males search extensively for females during the mating season. Adult males engage in a ritual "Combat Dance" during the spring breeding season. Necks and forebodies are intertwined, with the stronger snake slamming the smaller one to the ground until the weaker snake leaves the area. 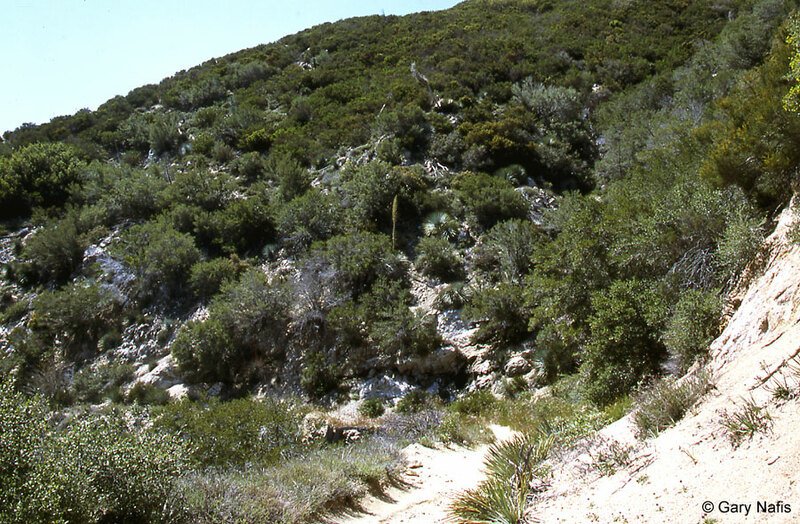 Found in a wide range of habitats from seaside dunes, to desert scrub, grassy plains, rocky hillsides, chaparral, open woodlands, and agricultural areas. 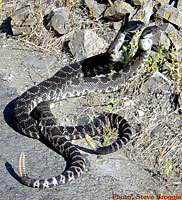 This subspecies, Crotalus oreganus helleri - Southern Pacific Rattlesnake, is found in California from Santa Barbara County, where there is a wide zone of intergradation with the Northern Pacific Rattlesnake north to around Morro Bay, east to the central valley and the desert slopes of the transverse and peninsular ranges, and south into the middle of the Baja California peninsula. 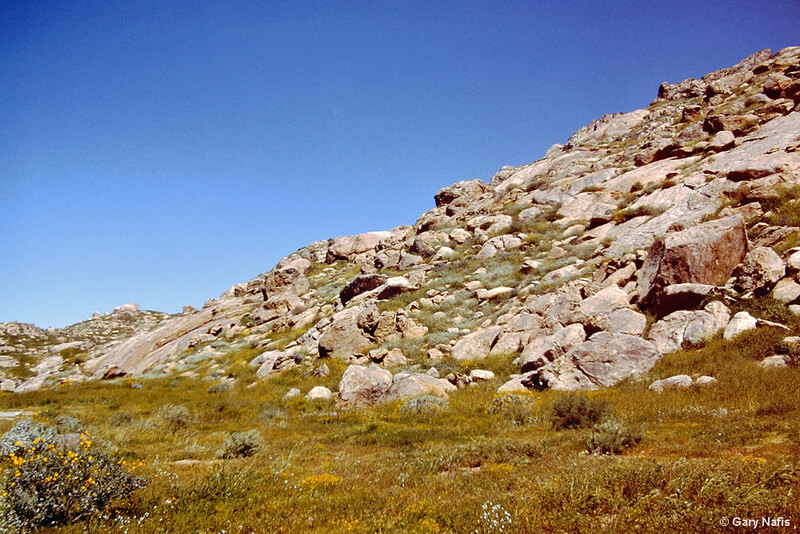 Ranges north of the transverse ranges into the Mojave Desert in the Antelope Valley and just south of Barstow. 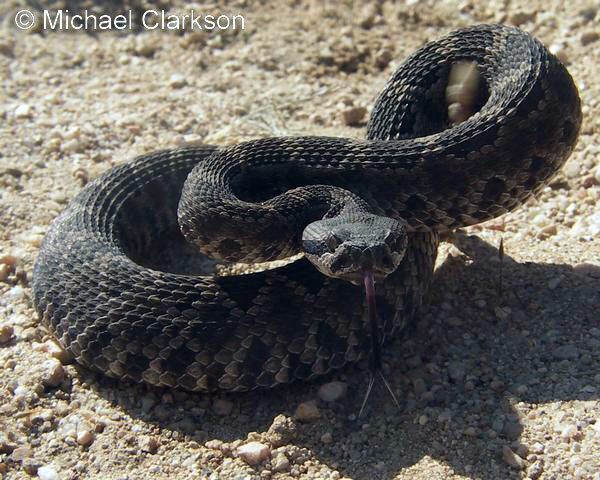 Known to hybridize with the Northern Mohave Rattlesnake where their ranges overlap in the Antelope Valley. 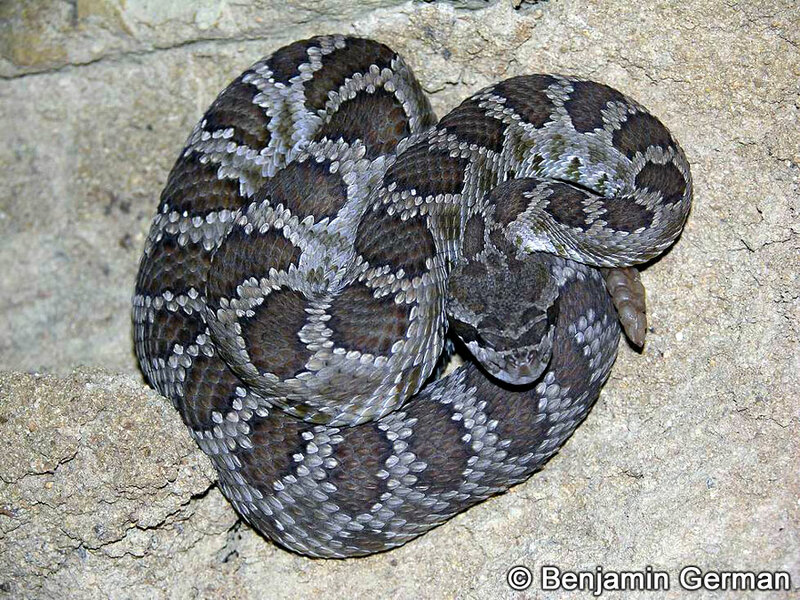 The species Crotalus oreganus - Western Rattlesnake, occurs from the Pacific Coast of northern Baja California north through most of California except the southern deserts, through Oregon and eastern Washington into British Columbia, Canada, and east into Idaho, Nevada, Utah, southwestern Wyoming, western Colorado,and northern Arizona. 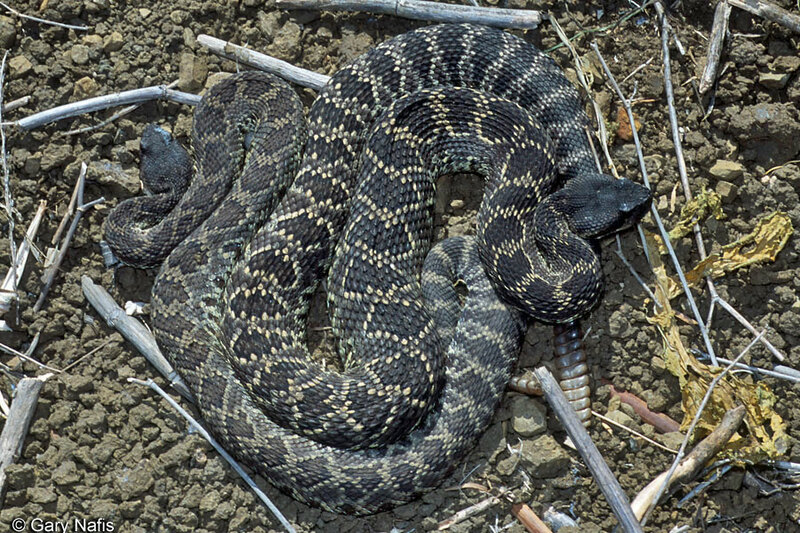 The taxonomy of Western Rattlesnakes is controversial with several different opinions, most of which recommend making the three subspecies found in California full species. 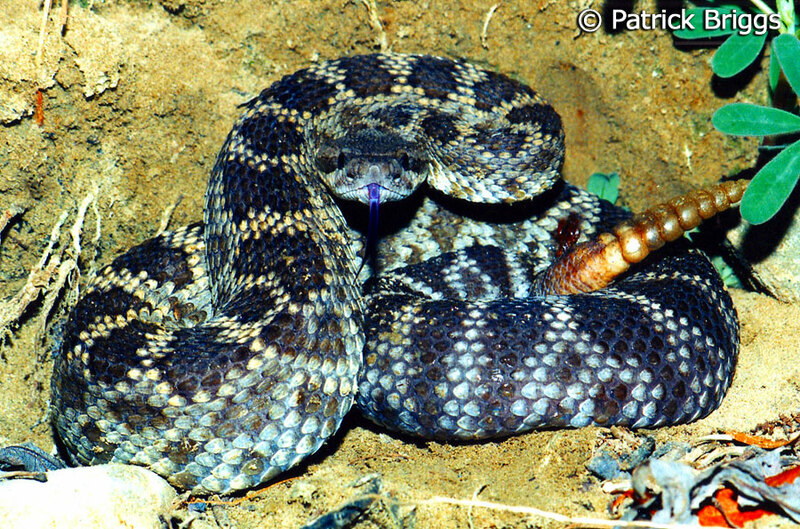 Some researchers still use the former species name Crotalus viridis and for them the subspecies represented on this page remains Crotalus viridis helleri . A study published in February 2016 used head shapes and genetic analyses to determine that there are 6 full species of western rattlesnakes found in the former Crotalus viridis complex and suggested the following names, with the three species found in California shown here at the top of the list. 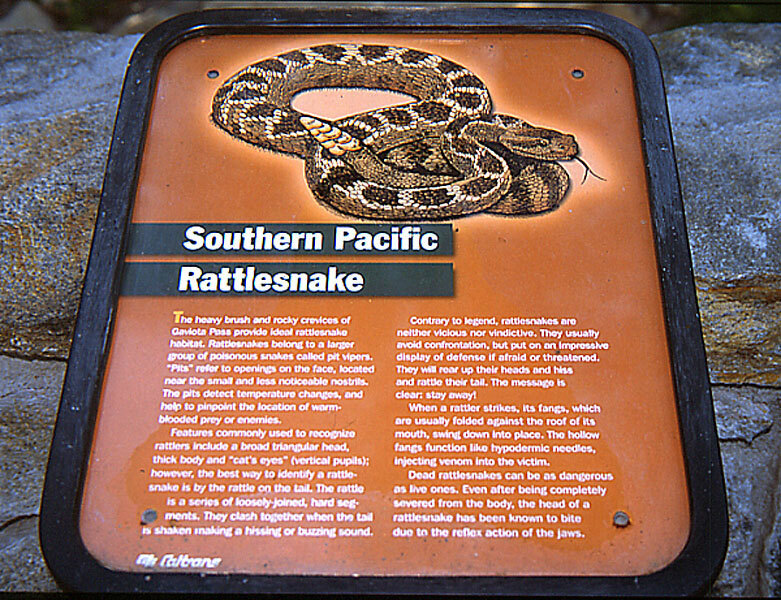 If this taxonomy is accepted, the ranges and common names of western rattlesnakes found in California will remain the same, but they will be full species instead of subspecies. Crotalus oreganus lutosus becomes Crotalus lutosus. The common names remain the same. oreganus - belonging to the state of Oregon - referring to the type locality, "banks of Oregon or Columbia River"
Ernst, Carl. H. Venomous Reptiles of North America. Smithsonian Institution Press, 1999. Hayes, William K., Kent R. Beaman, Michael D. Cardwell, and Sean P. Bush, editors. 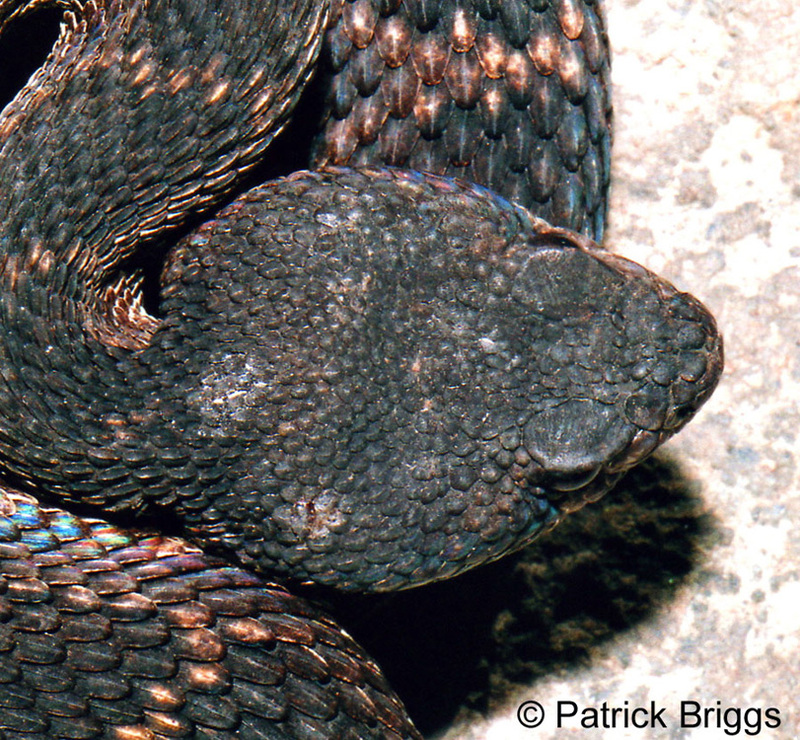 The Biology of Rattlesnakes. Loma Linda University Press, 2009. Hubbs, Brian R., & Brendan O'Connor. 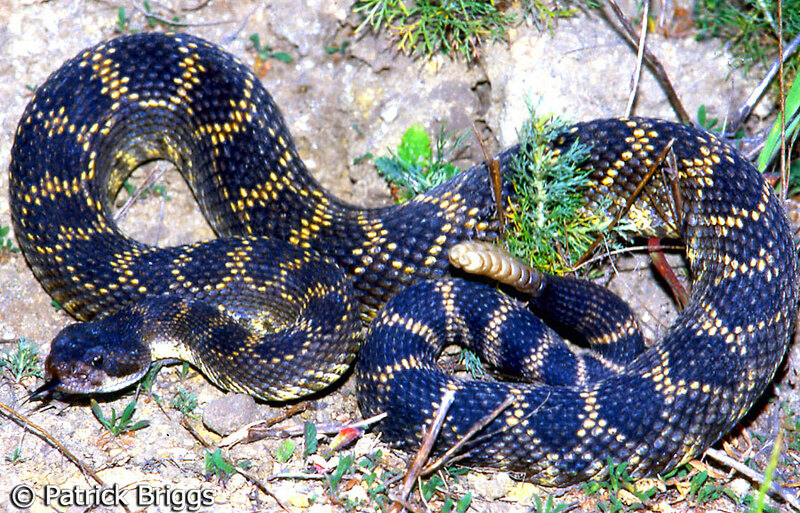 A Guide to the Rattlesnakes and other Venomous Serpents of the United States. Tricolor Books, 2011. Klauber, Laurence M. Rattlesnakes. University of California Press. (Abridged from the 1956 two volume Rattlesnakes: Their Habits, Life Histories, and Influence on Mankind.) University of California Press, 1982. Rubio, Manny. Rattlesnake - Portrait of a Predator. Smithsonian Institution Press, 1998. Walls, Jerry G. Rattlesnakes: Their Natural History and Care. T. F. H. Publications, Inc., 1996. Eric A. Dugan, Alex Figueroa, and William K. Hayes. 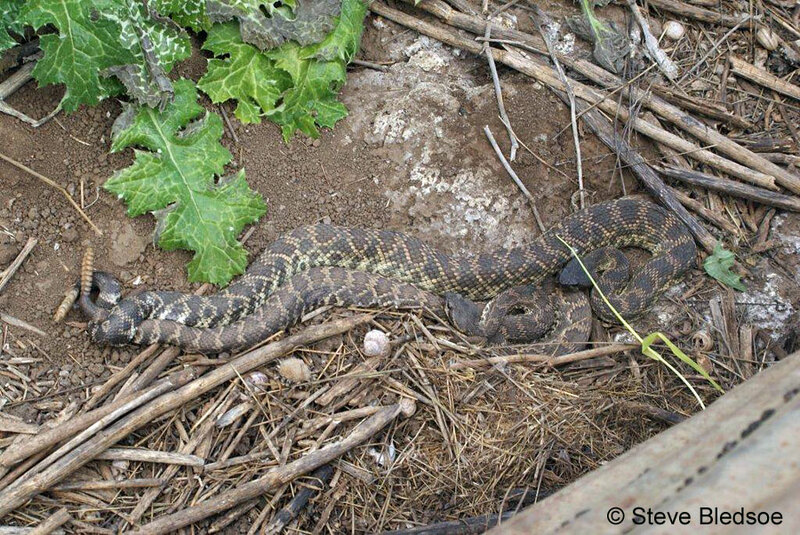 Home Range Size, Movements, and Mating Phenology of Sympatric Red Diamond (Crotalus ruber) and Southern Pacific (C. oreganus helleri) Rattlesnakes in Southern California. Pp. 353-364 in W. K. Hayes, K. R. Beaman, M. D. Cardwell, and S. P. Bush (eds. 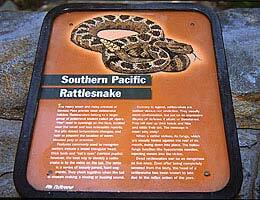 ), The Biology of Rattlesnakes. Loma Linda University Press. 2008.